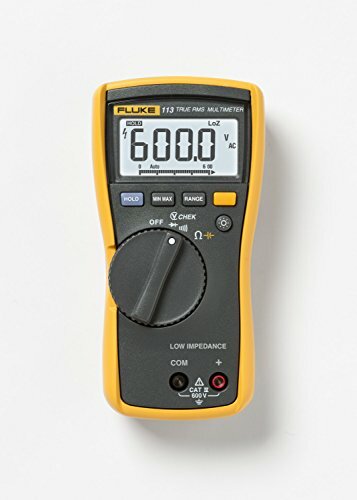 The Fluke 113 True-RMS Utility Multimeter is a digital multimeter (also known as a multitester) that measures AC/DC voltage to 600V, resistance to 60 kiloohms, and capacitance to 9,999 microfarads. The meter has a diode check for testing general-purpose germanium, silicon, and power diodes, and a continuity beeper which provides audible detection of resistance by turning on at less than 25 ohms and off at 250 ohms. It is also able to simultaneously check for voltage and continuity. This true RMS meter provides accurate readings when measuring linear or nonlinear loads where the current or voltage has a sinusoidal or nonsinusoidal waveform and has both manual- and auto-ranging capabilities for user flexibility. A Max/Min function records signal fluctuations and a hold function freezes measurements on the display. The 6000-count resolution, 3-1/2 digit digital display is backlit for readability in low-light conditions. The meter is safety rated for Category III to 600V and Category IV to 300V. It uses a 9V battery (installed) with a battery life of approximately 300 hours without backlight and has a sleep mode to maximize battery life. The meter measures 6.58 x 3.35 x 1.81 inches (H x W x D) and weighs 13 oz./404 g. (H is height, the vertical distance from the lowest to highest point; W is width, the horizontal distance from left to right; D is depth, the horizontal distance from front to back.) This meter includes a holster with built-in probe holders for convenient storage.